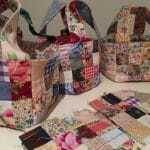 So you want to make a quilt? Many times I’ve heard people say. “One day I want to make a quilt”. Well…..what are you waiting for! 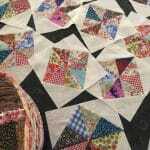 A quilt project may take some time, but you have to start somewhere. My mother always said “if you don’t know where to start, start at the beginning”. That may seem obvious, but often we don’t know – where is the beginning? 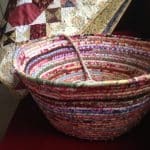 In the case of a quilt, the beginning may be a pattern you’ve seen, or a fabric/s you’ve bought, or a picture on line, or a magazine article, or if you’ve been lucky enough, an antique quilt. Use that, as a starting point. 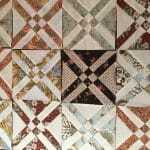 Or maybe you just want to make some quilt blocks to see how you like it. If it’s not for you you can always make them into a cushion. Start simple. Finishing something is an achievement. The fabulous thing about quilts is they are utilitarian. So it’s not like you would be making something that isn’t useful. 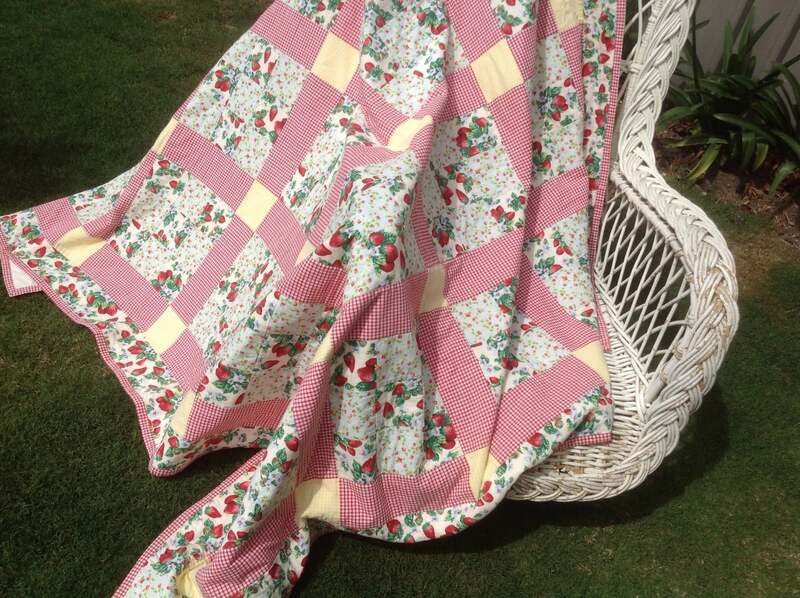 Lets face it, some of the most simple quilts and antique quilts are very beautiful. It doesn’t have to be complicated. 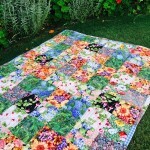 As much as I love scrap quilts, a starting quilt can be made with just a few fabrics and that’s probably the way to go. 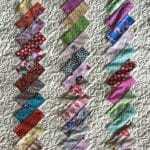 If you are thinking of beginning a quilt you may not yet have many fabrics to choose from, so just begin with a few you like. 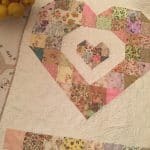 No matter what kind of quilt, they bring such joy, love and comfort and if you are the maker, a sense of achievement and creativity mixed with a certain sustaining therapy. 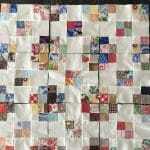 As an example, this is one of my earliest quilts. My inspiration was the focus fabric, which is the strawberry fabric with the cream bachground. I teamed with a second strawberry fabric with a teal background. That inspired the secondary fabrics which I looked for from the focus fabric, there I found the red and lemon. 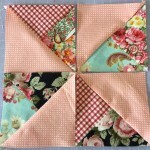 I made alternating nine patch blocks with the two strawberry fabrics. 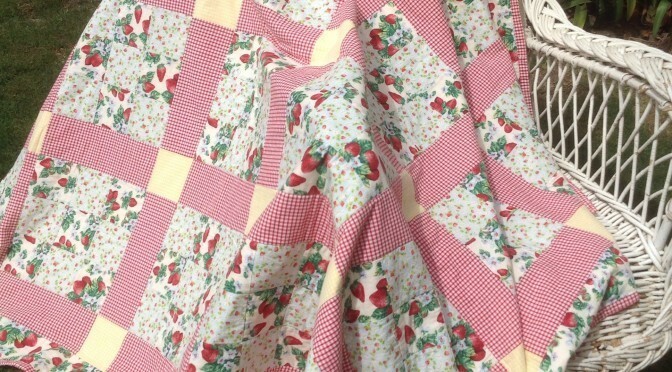 Then I sashed them with red gingham (makes anything look happy) and added cornerstones of lemon gingham. 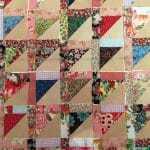 The blocks are big, so the quilt comes together quickly. The border is in the main strawberry fabric. I used a wool batting (never regret using wool), the backing is plain. 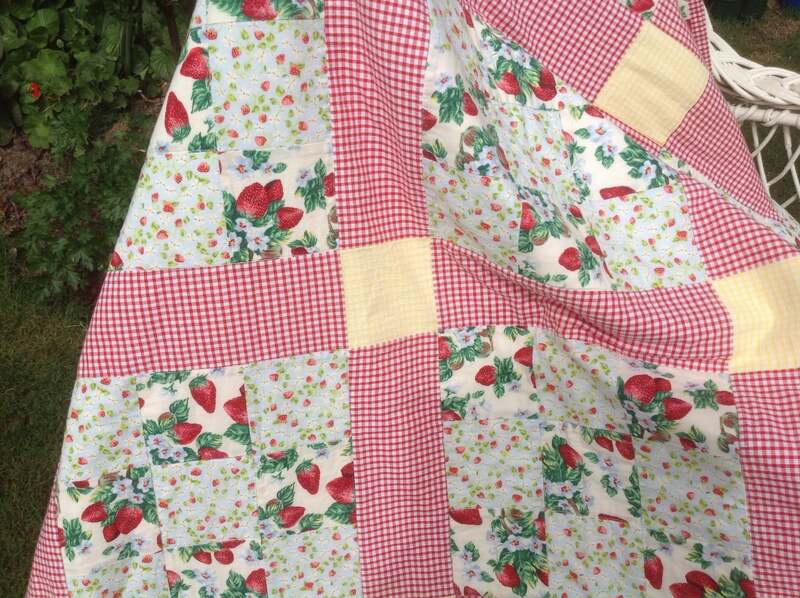 and the binding is in the red gingham which pulls the whole design together. 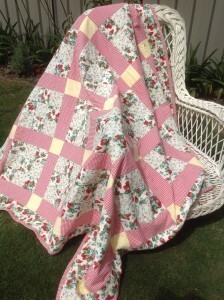 There is a quilt made with only four fabrics and one plain backing fabric.